Watch heads turn and jaws drop as you and your friends arrive in your very own H2 Hummer super-stretch from Hummer X Limousines. Imagine telling everyone that you hired a Hummer for your formal or deb and how it felt to feel like Hollywood superstars as you disembarked the limo to meet with your fellow classmates and invited guests. You are sure to impress as our limousines are big in size, style and presence and will have you feeling absolutely amazing as you cruise through the streets of Melbourne to your big event. Whether you choose our midnight black or pink LA style H2 Hummer limousines the attention will be on you. 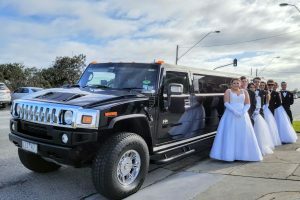 The team at HXL understands that your Formal, Graduation or Debutante ball is an exciting and fun milestone event, so why not hire a hummer to help make your special night a huge success. You just can’t surpass the big and spacious H2 Hummer limousine that will comfortably transfer up to 16 passengers in safety, style and comfort. Furthermore, you will appreciate our prompt and polished service as we arrive at your doorstep approximately 15 minutes early to allow plenty of time for photos and boarding. Whilst in transit you will enjoy cranking tunes from the big onboard audio system, laser show, complimentary soft drinks, chilled sparkling water and mints served from our ice bar. Your friendly and professional driver will ensure that you and your guests are well looked after and that you all get to your event happy and on time. Choose from our striking pink or midnight black limousines.